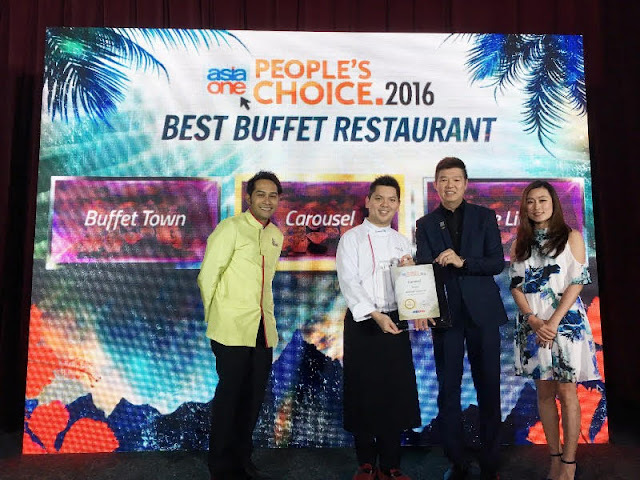 Carousel has been awarded the Best Buffet Restaurant at Singapore Press Holdings’ (SPH) AsiaOne People’s Choice Awards 2016 for the seventh year in a row. Carousel is the only restaurant which has been inducted into AsiaOne’s Hall of Fame since 2014. Organised by AsiaOne, SPH’s leading news and lifestyle portal, the awards ceremony celebrates prominent brands and products in Asia that are voted the best in each of their categories by AsiaOne readers. In celebration of the award, the hotel produced a three-minute clip, “A Day in Carousel”, depicting the immense amount of hard work, dedication and attention that are concerted behind-the-scenes from dawn to dusk to present the arrays of sumptuous food at Carousel. It also recognises talents of the hotel who are behind the building of Carousel’s brand since 2007. Eagle-eye guests of Carousel can try to spot familiar faces of the talents in the video. Viewers will have a glimpse of the ingredients’ journey as they enter the hotel and transform in the skilful hands of the talented culinary team, to be finally presented on the buffet counters. Watch out for the nimble hands of our expert service team setting up the tables and signature Carousel cutlery stands prior to the meal periods. The entire dining experience unfolds with each intricate detail that takes place after the curtain falls to bring guests the Best Buffet Restaurant, Carousel. Royal Plaza on Scotts also celebrated the win of a gold medal for “Petit Four or Praline” by Woody Kong from the pastry team at the recent international culinary competition, organised by Food & Hotel Asia 2016.